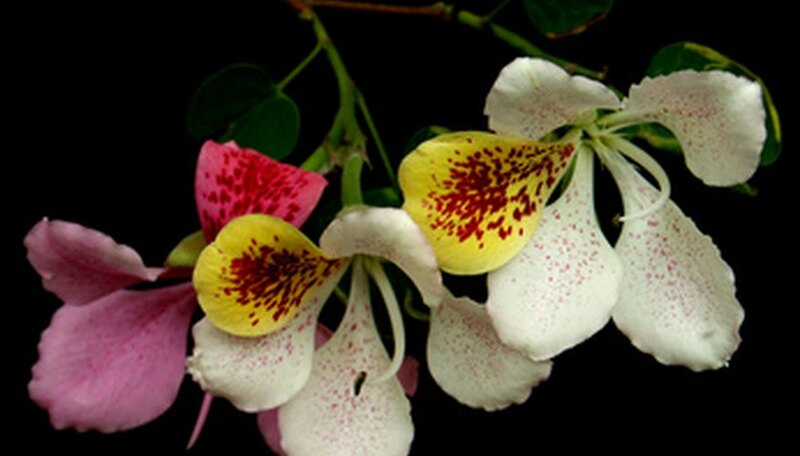 The orchid tree (Bauhinia variegata) is a member of the bean family. It gets its name from the purple, orchid-like blooms that burst forth on the bare tree in late winter or early spring and continue into summer. The orchid tree can grow to heights of 20 to 40 feet when planted in full sun within USDA Plant Hardiness Zones 9 to 11. Propagate an orchid tree from seeds or cuttings. Place the orchid tree seeds in a bowl of water and soak them for 24 hours. Remove the seeds from water and plant them, 1 inch deep, in 1-gallon planting pots, filled to within 3/4 inch of the rim with potting soil. Place the pots in a shady area and keep the soil moist, but not soggy. Transplant the orchid tree seedling into the garden after the last frost in your area. Take an orchid tree cutting in the summer. Cut a 6-inch branch from the tree. The cutting should be from the current year’s growth and partially hardened. This is known as a semi-ripe or semi-hardwood cutting. Place the cutting in a plastic bag until you are ready to plant it. Pour sand into a planting pot and water it until the excess water runs out of the bottom of the pot. Poke a hole into the sand to accommodate the cutting. Remove all the leaves from the cutting with the exception of two at the top. Dip the cut end of the branch into the rooting hormone and stick it into the prepared hole in the sand. Bury at least two leaf nodes (the bump on the branch where the leaves were joined to it), and pack the sand firmly around the cutting. Place the potted cutting in a plastic bag and place it on a heat mat set to 70 degrees, F. Allow the bag to remain open to allow the air to circulate. Check the soil periodically and mist it with water if it begins to dry out. Remove the pot from the heat mat and the bag when new growth appears. Place the cutting in a well-lit area but out of direct sun. Transplant the orchid tree into the garden the following spring, when all danger of frost has passed. The orchid tree should not be planted in Florida as it is considered invasive by the State of Florida. North Carolina State University: Plant Propagation by Stem Cuttings: Instructions for the Home Gardener ?